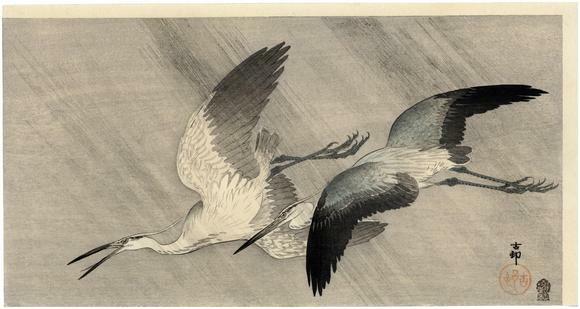 The title given by the Freer/Sackler Galleries for this print is Herons in flight in rain. It comes from the Muller collection. Listed and illustrated in Crows, Cranes & Camellias: The Natural World of Ohara Koson 1877-1945, p. 177. There is a later edition of almost exactly this same design, but it is signed Shoson, was published by Watanabe and dates from ca. 1930.